"End of the trilogy and return to Earth"
Will there be a sequel to "Under Stars" for John Mitchell's Lonely Robot project? Presented as the final part of the trilogy that began in 2015 with "Please Come Home" and continued in 2017 with "The Big Dream", this final episode of the guitarist/singer/producer's space adventures seems in any case to sign the end of the character "The Astronaut", and makes a comeback to Earth, addressing subjects as diverse as the addiction of our youth to new technologies as a question about the sustainability of the star that offers us its radii full of life every day. We will not surprise any of our readers by specifying at the outset that the style of this new production is in line with the neo-progressive / prog FM movement dear to John Mitchell, distilled by his talent in all the bands where he has been involved to date. Alone at the controls of Lonely Robot and simply accompanied by Craig Blundell (Steve Hackett, Steven Wilson...) behind the drums and Steve Vantsis (Fish) on bass on half of the tracks, our handyman offers us eleven tracks, each more melodic than the other, concocted with a permanent attention to detail, the arrangements creating literally captivating atmospheres. The progressive touch is brought by regular instrumental breaks, carried by sharp guitars and a few well-smoked keyboard solos, but also by a regular use of syncopated rhythms where we find all the contribution of a high-flying bass/drums duo. And John Mitchell will be credited with not overemphasizing himself with his six-strings, his solo interventions remaining ultimately quite limited, but always judicious. The whole is delivered by a magnificent production, full of finesse, full of clarity, highlighting both the instruments and John Mitchell's slightly hoarse voice, further emphasizing the very accessible nature of the 50 minutes proposed here. To those who would only see in this production a new neo-progressive album with no particular originality, I would answer that in this case, it is like for hunters: there are the real artists, those who trigger emotions and arouse interest, and the bad ones. Undoubtedly, John Mitchell is in the first category and if indeed, the listener in search of convoluted and tortured structures will pass his way without regret, lovers of the genre will once again enjoy themselves. 09. How Bright Is The Sun? 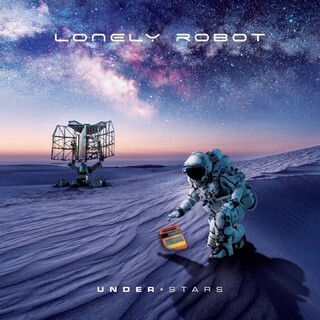 LONELY ROBOT: Details on "Under Stars"